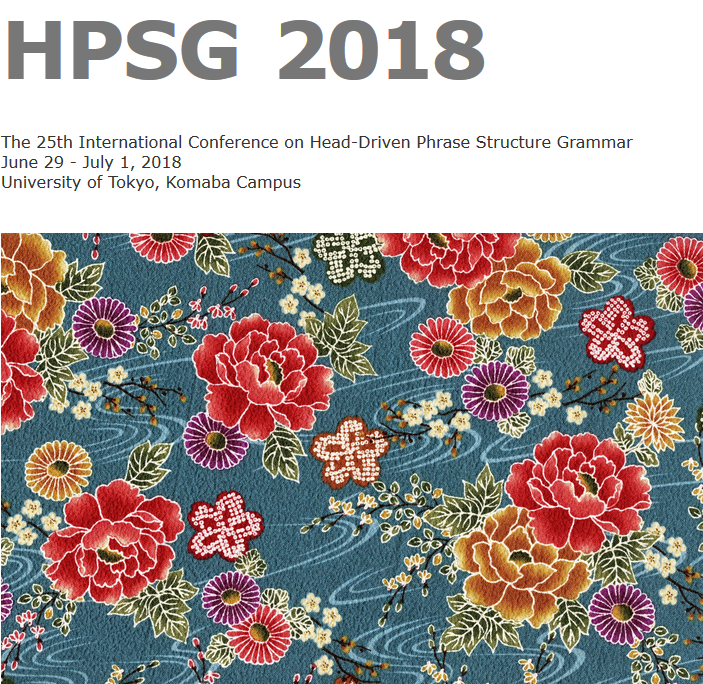 The HPSG 2018 conference will begin with a one-day workshop on the clause structure of Japanese and Korean, which will be followed by a 2-day main conference. Abstracts are solicited for presentations which address linguistic, foundational, or computational issues relating to or in the spirit of the framework of Head-Driven Phrase Structure Grammar. One aim of this workshop is to promote cross-framework discussion, and therefore we strongly encourage researchers from outside the HPSG framework to submit abstracts for this workshop. Possible topics include, but are not limited to, whether predicates and suffixal morphemes following them, which together form prosodic constituents unambiguously, ever form morphosyntactic constituents as well, whether predicates are ever raised from their "base" positions, and whether each type of scrambling can be regarded as an instance of Move (or, in the HPSG parlance, SLASH-mediated long-distance dependency). There might appear to be something of a consensus regarding some of these issues within a given research community, but there is no discipline-wide consensus on these and related issues. (30 minute presentation, plus 10 minute discussion). All abstracts will be reviewed anonymously by at least two reviewers. They should not include the authors' names, and authors are asked to avoid self-references. The HPSG 2018 Conference will take place on the Komaba campus of the University of Tokyo. The conference proceedings will be published online by CSLI Publications and include the papers presented at both the main conference and the workshop. A call for contributions to the proceedings will be issued after the conference.